The purpose of the Introduction lesson is to inform and explain what the group is to those who show interest in joining. 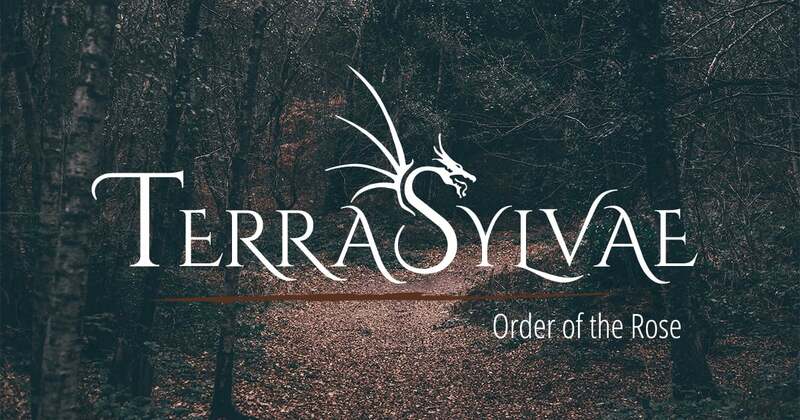 Everyone who comes to Terrasylvae and the Order of the Rose should feel welcome and believe that they could find a place with us around our fire. 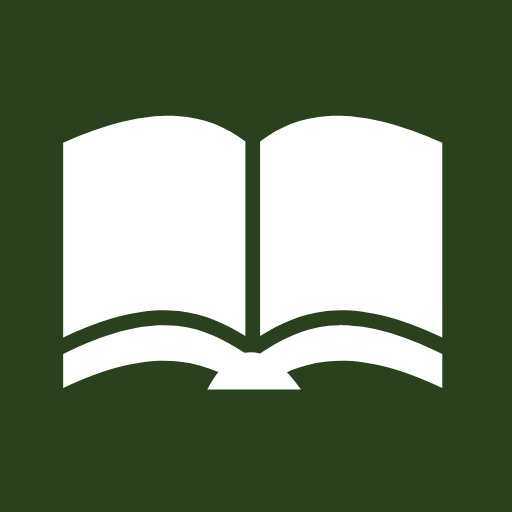 Click the Button to jump to How to Teach the Introduction. Welcome to the Order of the Rose! The Rose is a symbol of what we stand and fight for. We believe that each fighter should carry within themselves an ideal unique to their morals, virtues, and visions of self improvement. This is represented by a rose that we wear on our left shoulder once we have become Swordsmen in the group. When members look at their rose, they should reflect on what it means to them. It should reflect the best, and noblest ideals. Something that they would truly be willing to fight for to preserve. Our Fencing Season runs from the first Friday in March until the last Friday in October. We meet every week on Friday evening at 5:30 p.m. until about 9:00 p.m. Our practices are typically held at Woodland Park (300 S 200 E, Farmington, UT), but varies based on availability. Dueling Practice: Practice will focus on the skills and trainings of fighting as an individual against a single opponent. Melee Practice: Practice will focus on the skills and scenarios of fighting in a melee or group battle as a team. Open Practice: Practice will focus on resting from our training and fencing with friends. No lessons will be taught on these days. On Dueling and Melee Practices, the first hour (6-7pm) is reserved for lessons. A single lesson for each rank will be taught during that time by the Officers/Swordsmen to help fencers learn and progress. On Open Practices, no lessons from the Training Manual will be taught. Instead, the first hour will be used for students to work one on one with mentors or officers on the skills they have recently learned or are hoping to refine. Masters and Apprentices can also use this time to work together. The rest of practice will be used to participate in a wide range of trainings, activities, and scenarios that have been planned by various members and Officers. Fencers should also continue practicing the skills taught at the beginning of practice. When you start out in the Order of the Rose, you’ll have the rank of Newcomer. Then, as you learn each lesson and prove to the Officers that you’ve gained sufficient skill, you’ll progress through the following ranks. Click on each of them to learn more about each rank and what is required to advance. All students of the Training Program begin with the rank of Newcomer. Newcomers focus on gaining the basic skills of fencing, enough that they may participate in all the various activities held at practice. Once a Newcomer has completed all of the Newcomer lessons, they may schedule a Test Match with a Sergeant, who will review and ensure the Newcomer has met the following criteria. If the Newcomer meets all criteria and passes the Test Match, the Sergeant will recommend them for advancement to the Captain. Newcomers who advance to the rank of Initiate will continue developing fundamental skills that we believe all fencers should possess. Initiates will also be given a simple notebook that will be used as a personal Fencing Journal. This journal should be used to record lessons, thoughts, and progress of the student through the rest of the Training Program and beyond. Once an Initiate has completed all of the Initiate lessons, they may schedule a Test Match with a Lieutenant, who will review and ensure the Initiate has met the following criteria. If the Initiate meets all criteria and passes the Test Match, the Lieutenant will recommend them for advancement to the Captain. Initiates who advance to the rank of Novice will continue learning skills and tactics that will lead students into developing their own style and focus as they move towards becoming a Swordsman. Novices should focus on experiencing the breadth of what fencing has to offer and discovering what they enjoy and have interest looking into further. Once a Novice has completed all of the Novice lessons, they may schedule a Test Match with the Captain, who will review and ensure the Initiate has met the following criteria. If the Novice meets all criteria and passes the Test Match, the Captain will recommend them for advancement to the rank of Swordsman. Upon completion of the Training Program and taking the Swordsman’s Oath, students will graduate to full members of the Order of the Rose. Swordsmen have a gained an understanding of the Four Levels of Importance, when to apply them, and have the base skills necessary to train on their own. Under the direction of the Master Swordsman, they will continue their journey, developing their own style and understanding of fencing. Students can track their progress using the “Steps to Become a Swordsman” checklist. You can print out your own copy using the button below or receive a copy from an Officer. The entire Training Program takes 1 ½ to 2 seasons to complete, depending on attendance and dedication. Upon completion of the program, you’ll be granted the rank of Swordsman. Becoming a Swordsman is not the end of your training. It merely becomes a more personal journey and endeavor. We encourage all Swordsman to rededicate themselves to training and to find a master or an apprentice. Note: Due to the nature of the sport, the minimum age to fence with the Order of the Rose is 14. The Captain oversees the whole of the Order of the Rose, and is assisted by 2 Lieutenants and 4 Sergeants. Each officer accepts the added responsibility of running the group and leading the group both on and off the field. The Exchequer assists in recording the progress of members and the financial status of the group and its members. The Quartermaster oversees the loaner gear. They ensure that everything is returned promptly and is in good repair. There is a little paper work that needs to be done before you can start. The first thing that we need before anyone can fence with us is a completed Code of Conduct & Accident/Injury waiver. This needs to be filled out completely and given to one of the Officers. You can get a waiver from an Officer or print one out using the link below and bring it to the next practice. We want to remind everyone not to buy their own gear until they consult with one of the Officers. We have a large selection of loaner gear that can be used until you get your own. The only required piece of gear that we do not provide is gloves. Any heavy duty gloves from a hardware store will work. We recommend leather gloves that fit well and have a cuff to cover your wrists. These should be brought to your next practice. We would rather everyone be able to come and be a part of the group than charge a lot of money to participate. That’s why the first month of training is free. You’ll be able to use our gear and try it out. After the first month, we ask for a flat–rate of $5 on the first Friday of each month to use our loaner gear. Gear Rental Fees are to be given to the Exchequer or a Lieutenant. All monthly fees go back into the group and are used to fund activities or maintain and replace gear. Additionally, once you have acquired your own gear consisting of a helmet, gorget, sword, and vest, your monthly fee will drop to only $2 a month. If you are concerned with the monthly fee, please talk with an Officer. Monthly fees may be waived by providing service to the group, or by acquiring your own set of gear (Sword, Helmet, Gorget, and Vest). Each fencer must be up to date on their monthly fees, before they are allowed to use loaner gear. Note: The gear we use can be expensive and difficult to replace. We are happy to let members use our loaner gear, but we ask that everyone treat it with respect and care. Woodland is our home in Terrasylvae and you’ll hear places referred to every practice. Some will be a location within a scenario and some will be mentioned in stories and lore. Either way, getting familiar with Woodland will help you follow along as you learn and participate with the group. Below is a map that highlights some of the most common landmarks and locations mentioned within the group. Each of those are marked by a number that is referenced to in the map’s legend. The red dotted-lines mark trails through the forest that you can follow. Finally, Woodland is made up of three sections: Upper, Middle, and Lower Woodland. These sections are separated by pavement or asphalt. 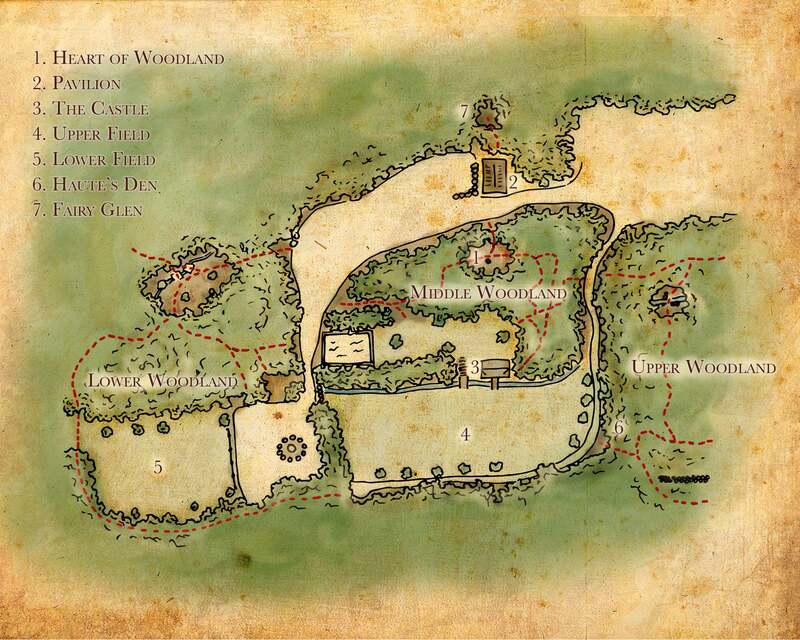 During your Introductory lesson with us at practice, ask an officer to give you a tour of Woodland and point out these landmarks so you too can become acquainted with Woodland. The last thing you’ll notice is that most everyone in the Order of the Rose has two names, a mundane and fencing name. Your fencing name is your persona, or medieval version of yourself. It’s mostly for fun, but can lead you to study and create a personal history or story to who you are within the group. Ask around to some of the members and learn about their stories and personas. We recommend that you choose a fencing name within the first few weeks after you attend your first practice, while you’re still introducing yourself. Any name will work, but most are Medieval European origin names. Every now and then we want to contact the members of the group quickly for announcements or change of plans. We’ll do this through Facebook and our Texting Group. Follow these instructions to join the texting group. Don’t have a mobile phone? 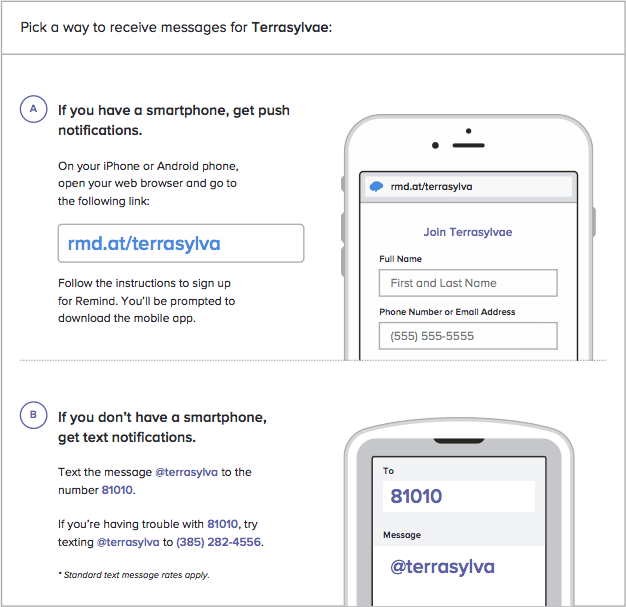 Go to rmd.at/terrasylva on a desktop computer to sign up for email notifications. Explain the following topics to help each Newcomer understand more about the group and what is expected as a member of the group. As you explain each topic, show or introduce the Newcomer(s) to the different parts of the group. Give examples and stories of how you started in the group and what helped you learn. The Demonstrate and Guide steps may be combined by walking the Newcomer(s) through the group and helping them become familiar with the members, schedule, and procedure of an average practice. At this stage, each Newcomer should be able to explore the group on their own a little. This would be a good time for you as an Teacher to step back and allow another fencer to continue working with them as a buddy. Find ways that a Newcomer could participate in the practice scenarios or trainings, without needing to fight. Have them help setup/run a scenario or training. Sit out and watch a scenario with them and explain what is happening as you watch. Introduce them to various members of the group. They’ll receive a welcome text from Remind. If anyone has trouble with 81010, they can try texting @terrasylva to (385) 282-4556. You’ve completed your first lesson! Good job! Let’s move on to the second lesson.